Local Area Network cabling faults can be a difficult to diagnose - unless you have the CZ20350! This easy to operate LAN tester enables you to test your wiring and connections at installation or after maintenance, making it one of the most convenient tools on the market. With the press of a single button you can automatically run a barrage of tests, including tests for Continuity, Opens, Shorts, Crosses and Splits. You can also identify which pairs require correction; The unit will scan all combinations without you having to do anything other than initiate the test. Even cable shield is tested for continuity! 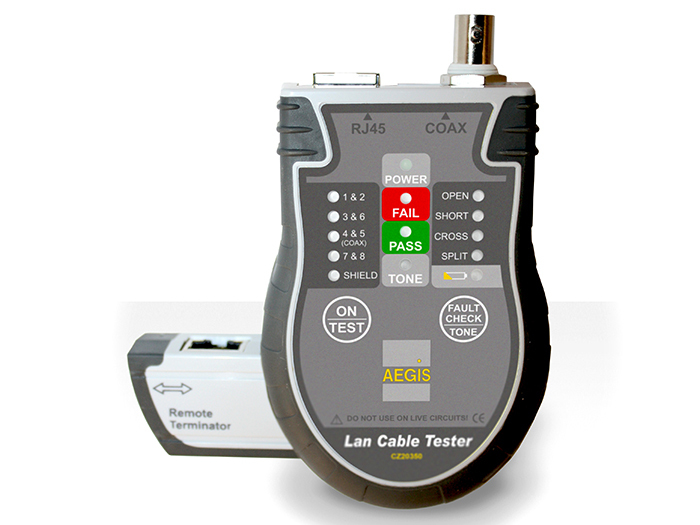 Building on the features provided by other testers such as the CZ20250, this LAN tester will also test coax networks and provide a tracing tone for cable identification. And it tests for all these at lightning speed, saving you as much time as possible. The test results are displayed via LED above the test button. The Pass or Fail result is instantly recognisable; you don’t have to waste any time deciphering the display. Any faults detected are also displayed by LED indicators. Low battery is also indicated, and can be tested for. In order to conserve power, an auto shutdown feature is standard. Adding to convenience of the CZ20350, the remote unit is housed within the master unit and a belt clip and 1.5V batteries are included with your purchase.